Polly Plummer and her next-door-neighbour Digory are exploring one wet afternoon when the accidental discovery of some magic rings sends them off on the most exciting and dangerous journey of their life. They fall through magic pools to the ruined city of Charn where Digory awakens the terrying figure of Jadis, the last Queen. But with true evil comes true goodness, as the children discover when they come face-to-face with the mighty lion Aslan. 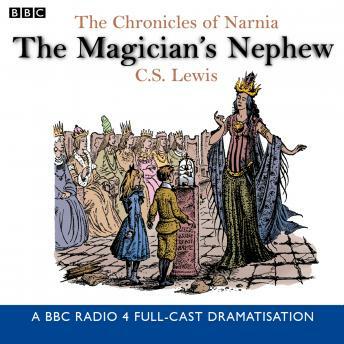 Soon the children's Uncle Andrew, along with an unwitting cabbie and footman, has joined them - and together they witness the lion Aslan's creation of a wondrous new world... So begins the universally loved and acclaimed series of stories in which good and evil do battle in the spellbinding, magical land of Narnia.